Summer is upon us and there are so many things to do! 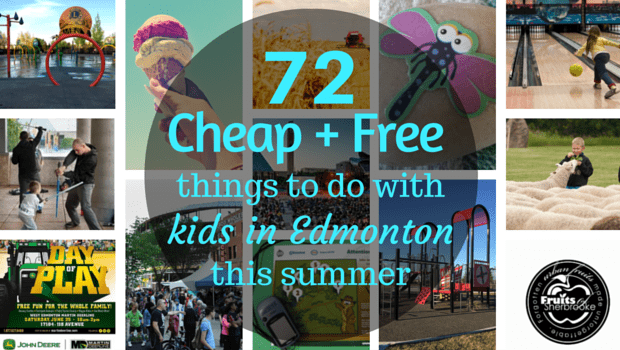 With so many families being more budget conscious this list of 72 cheap + free things to do with kids in Edmonton this summer is great to have on hand! Check it out! Watch some of the best trained dogs at the Edmonton Kennel Club Dog Show Aug 4th-7th. July 4 th -26 th enjoy some free fun around some of St.Albert’s parks with Cruisin’ Clubhouse! Events are Monday – Friday 9:30- 12:30 + 1:30-4:30 at various locations. July 8th -17th check out some family friendly entertainment, the kids zone, be your own busker area and more at the Street Performers on Churchill Square. Celebrate Edmonton’s first responders at First Responders Day June 9th 11am-2pm. See over a dozen emergency response vehicles, live music, food trucks ($$) and more. Attend Babies “R” Us Mommy Mixers once a month with your little one. Details here. Celebrate the Carrot Community Arts 9th birthday with a free BBQ and more on June 25th. Go around the world in 80 stories at the Tales Storytelling Festival Saturday May 28th. Attend the 3rd annual Windermere Day June 5th! FREE and there will be bouncy castles, sparkle tattoos, entertainment from the Edmonton Public Library and more! Volunteer at on of the What the Truck?! events this summer. Plan a camp out in your backyard or in your living room. Go on a Green Shack hop around Edmonton. Geared towards children 6-12yrs. Children under 6yrs must be supervised. See website to plan out your Green Shack destinations! Stroll the Millers Crossing Farmers Market in North Edmonton. Shop local vendors, meet new people and see some awesome entertainment. Attend the Klondike Days Parade on July 18th! The parade starts at 10am but get there early to find a good spot. Get all parade details here. Pack a picnic and explore one of Edmonton’s awesome parks! Attend the 4th Annual RMHCNA Block Party Sunday June 26th 11am-7pm. Live entertainment, food, and outdoor games for the whole family. Watch some hockey at Play On! Edmonton June 4th + 5th. Go on a summer drive and check out one of these awesome + yummy places to get ice cream. Attend KidZone at The Marketplace at Callingwood 2pm-6pm the third (July 27th, + Aug 17th) Located in the Callingwood Professional Centre lobby at 6650-177st. Join Martin Deerline West for some free family fun at their Day of Play event June 25th! Channel your inner Jedi with Lightsaber training Wednesdays 7pm-7:45pm at Churchill Square. Get directions to Churchill Square here. Take your pick of one of the many free programs through the Edmonton Public Library. Sing, sign, laugh and learn, Lego, Family story time and so. Much. More. See what Edmonton Public Library events are happening in your area. Get your FREE tickets to the Mercer Summer Super Party! Join one of the free activities happening with Boys and Girls Clubs Big Brothers Big Sisters of Edmonton and area. There are several locations throughout Edmonton that offer a safe and fun atmosphere Check out the website to see where the closest club is to you. Take in a free movie at Movies on the Square (August 2nd, 9th, 16th, + 23rd) Entertainment starts at 7pm + movies start at dusk. Bring a lawn chair, snacks and blankets. Spots are first come first serve so come early to grab your spot! Participate in the Simply Supper Lemonade Stand Day Aug 21st to raise money for the Edmonton Stollery Children’s Hospital Foundation. Take in one of the MANY outdoor spray parks located around Edmonton. 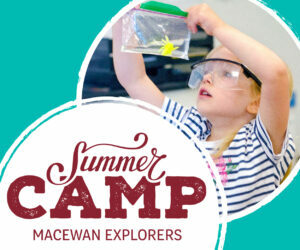 Sign out a free GPS unit from John Janzen Nature Centre and go Geocaching. (Some personal information required). Call 311 for more information. Join Tot Time at Mill Woods Towne Centre 10am-12pm the first Tuesday of the month (June 7, July 5, + Aug 2). Located at 2331 66 Street and takes place at center court in the mall each month hosts a different activity! Attend a City of Edmonton Fire Safe Communities Open House (May 28th, June 5th, July 16 + Aug 20th) Different fire halls each time, see where the next one is taking place. Get 2 free games of bowling a day through Kids Bowl Free. All details here. Have a beach day and check out some of these beaches close to Edmonton. Give fishing a try at one of the FREE Kids Can Catch events. Download the Farmer’s Market app and find a Farmer’s Market close to you, or explore a new one! Attend the Healthy Families Community Expo. Enjoy a petting zoo, bouncy castles, and more June 25th. More details here. Get in on some free popsicles! Follow the Now Trucksicle on Twitter and see where it’s going to be for the day! Join one of the City of Edmonton FREE bike safety courses. See what community is closest to you. Gather ingredients for exploding paint bombs and watch them explode! Host a playdate picnic or a stone soup lunch. Book the classroom for FREE at your local Micheals, select a theme and have a kids group crafternoon. Join in the activities at Sherwood Park Mall the 3rd Wednesday of the month for Park kids 10am-12pm. Attend the Family Picnic in the Park with Edmonton’s Child, Italian centre Shop & Box Social Event planning on July 24th. Stay tuned for more details! Have fun in nature and help plant trees at Root for Trees Fest June 4th. Attend Kite’s over Callingwood Sept 3rd. Free Kite kids to the first children, see large kites fly, and the anticipated candy drop! Do you have more ideas? Send me an email at anotheryegmommy@gmail.com to add to the list. Would you like to put the Miller Crossing Farmers Market in NE Edmonton as a free destination where parents and kids can enjoy not just shopping local food, crafts, arts…, but also socializing with other kids/parents. In addition to local farm products and local business, we have very nice entertainment program with different musicians, dancers, face painters, bouncer castle, food trucks coffee, drinks.